Neat & Tangled February Release + Video! Welcome back everyone! It’s time! 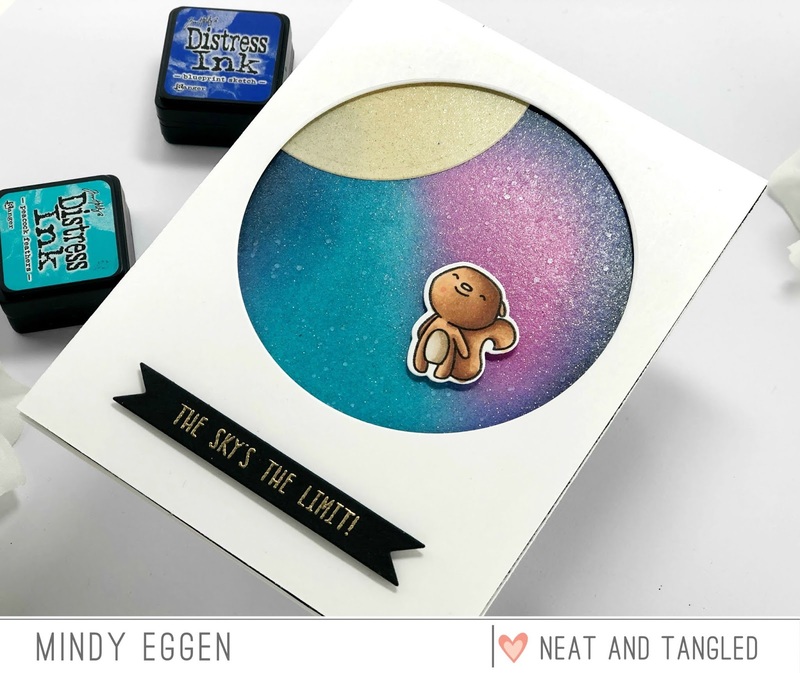 The February 2019 release from Neat & Tangled is now available for purchase! I have one more card to share with you today but first…. how about a video? I created a video going through all the new products from the release PLUS I’m recreating a card I made earlier this week. You can view the video down below or HERE on my Youtube channel. 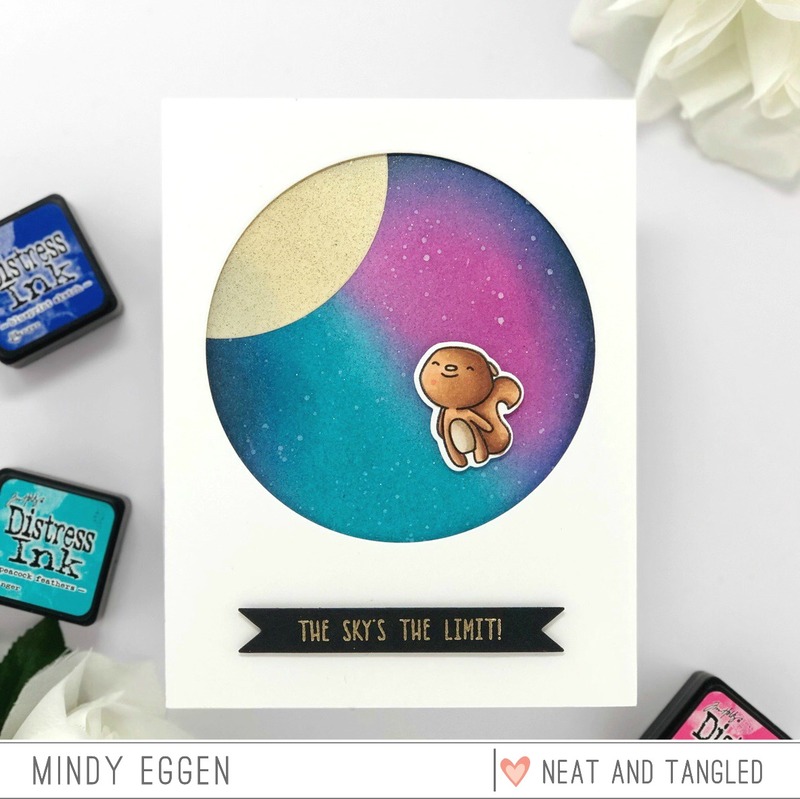 For my card in today’s post, I used this fun little squirrel from the Jump For Joy stamp set. Does anyone else picture Sandy from Sponge Bob? I totally see it! I stamped my squirrel in copic friendly ink onto Neenah White card stock. Then colored with copic markers and cut out with the coordinating dies using my Gemini Jr. This squirrel looked like it was really flying so I thought a fun galaxy-ish background would be cool. I ink blended Peacock Feathers, Picked Raspberry, Chipped Sapphire and Black Soot Distress Inks onto Bristol Smooth card stock. I added flicks of white paint to look like stars and also sprayed my background with Thermoweb Iridescent Glitter Spray. For the moon, I ink blended a piece of card stock with Antique Linen and then cut out with a circle die. I also sprayed the moon with the glitter spray and then added to my background. I die cut a circle from a piece of 4 1/4″ x 5 1/2″ white card stock and added to my ink blended panel with foam tape. I die cut a banner from the Skinny Strips die and then heat embossed the sentiment in gold embossing powder. The sentiment is from the So Fly stamp set. I thought it worked perfectly with my scene. Be sure to visit the Neat & Tangled blog for more inspiration! Head on over the Neat & Tangled site and pick up your favorites from the new release! Affiliate links may be used at no cost to you. Just click on the picture below and it will take you right to the site to start shopping. Fantastic card! Such a darling little happy face!